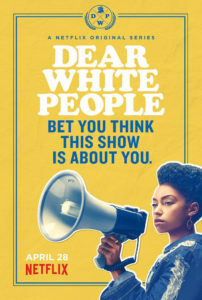 On this fun and honest episode, Dr. Alex Gee teases his upcoming full discussion of the Netflix series Dear White People by sharing his thoughts on the first episode. Dr. Gee is joined by some of his podcast crew to get a White perspective on the topic of White people entering Black spaces, such as Black churches. Plus, hear the group struggle to understand the use of the phrase “Frickin’ A.” You don’t hear open discussions on race like this anywhere else.